Today is the big day! A beautiful bride is set to wed the man of her dreams. Everything is just right. The party favors are set-up for the celebration, the food is being cooked to perfection, and the guests wait in anticipation in their nicest clothing. But before they can partake in the eating, the dancing, and the toasts, the ceremony must take place. The highlight of this part is usually the sighs and gasps of the audience as the bride in her astounding dress makes her way down the aisle methodically. There was word that a notorious make-up artist made the bride’s face for the occasion. It is time! She walks down the aisle gracefully with her face appearing as good as ever. Then why the heck is she wearing a veil over it? It has become a Western tradition for the bride to conceal her face during her wedding, until she is officially married. This primarily stems from the notion that it is bad luck for the groom to see his bride on their Wedding day prior to their vows. 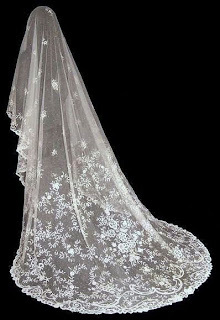 The veil is also a symbolic object, demonstrating honor and humility for the ceremony to take place. Additionally, the veil holds religious significance in the Western religions, for citations within holy text, along with that most depictions of the Virgin Mary show her veiled. However, this was not the original purpose of the Bridal Veil. It was to ward off Evil Spirits. In the life’s cycle, marriage is an indication of the female’s transition from a stage of innocence to one of adulthood. Though the Spirits do not need to follow a code of conduct, it was thought that they would manifest themselves within an individual once their innocence was lost. Thus, the wedding was a ripe time for the Evil Spirits to reveal themselves and release the blight. This idea formed coinciding with the development of man’s first organized religions. In fact, the use of bridal veils is mentioned in one of the oldest known texts - from an Assyrian Legal Code in the 13th Century B.C.E. That is over 14,000 years ago! At different points in chronology, the worry about the Evil Spirits attendance during a Wedding ceremony has heightened or lessened. In the city-state of Sparta in ancient Greece, brides-to-be used to cut their hair right before their wedding. This was in attempt to confuse the Evil Spirits into thinking that they were men, and to leave them alone. Additionally, the Bridesmaid was a development to assist in warding off these Spirits. It was believed that if a bride surrounded herself with women of the same age, the Spirits would again become confused, and not be able to recognize her. With this last idea, the tradition many people now practice developed. The Spirits could not distinguish the bride from the bridesmaid, but the groom could. Now, the bride walks down the aisle in a quasi-disguise, and awaits her groom to recognize her!